Love is like a match, it burns, but it won't last forever. Thanks for making me realize man! again, very thought provoking.... Brilliant idea a work with such depth. Very clever......and often a very true picture of love....lol..........great work! Bad-*ss and so very true...I love the way you see the world and how you share it so perfectly - ur amazingly talented!! The right picture remembers me of myself and my father. But only, that we're seperated all the time. Perfectly captures the desire that people often mistake as love. Real love has it's highs and lows, but you expect to emerge from then lows and not self destruct. This is absolutely beautiful. It's such a creative and simple way to convey a lot of emotion. But look, even though the figures seem to have grown cold, they still smolder from each others embrace. greatly reminds me of two people meeting in a bar and have a few to many drinks together and the really hit it off and go home together and drink some more, and then they have a wild passionate night together. Then they wake up sober and with a killer hangover, and then they realize what they had done and now they have to live with the consequences of their actions. 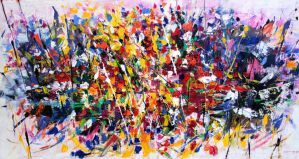 Would you consider your work abstract expressionalism? Hello! I just wanted to let you know that this wonderful piece has been included in my journal art feature here: scribalwriter.deviantart.com/j…. This really hits home for me. My girlfriend and I started off stronger than I ever knew two people could. Right now things are not so great. She's dealing with issues and all I can do is give her what strength I have and hope its enough to get her through. Thanks, you two as well! Yep. So this is beautiful. Powerful. And accurate, I guess ! I just love it! so many emotions!